My opponent didn't touch the chess clock in this game. He had a friend who did it on his behalf. I asked why and his friend its some Jewish thing. So I had no issue with that. But its quite interseting! I defended a tough position against William Gray yesterday in Tuesday Night Marathon. IM John Donaldson, analyzed the game and published two diagrams of the position in the Mechanics Institue Weekly Chess Newsletter (#654) this week. Here is his analysis. Here white offerred a draw and black accepted. I faced Hans for the first time although we have been playing in many chess tournaments in including in Mechanics Chess Institute for more than a year. I had a very tough position to defend once I grabbed a pawn in the Sicillian Alapin. Hans is well versed in the variation where I made an early inaccuracy as I dont know the variation very well. But I am happy that I gave a tenecous defence which resulted in Hans' attack dry out. And once an attack fails, the attackers own defence become very vulnerable. This is exactly what happened and I counter attacked and check mated him. There are few inaccuracies in the game but overall I played well. A very important open game to analyze. With this win I am leading the Tuesday Night Marathon in Mechanics Institute, San Francisco with 4 or 5 other people scoring 3 out of 3! I often go to Fremotn Statbucks near Mowry and Blacow Road crossing for coffee as there is a group of chess players who play chess everyday there. While picking up coffee last evening, I saw a game that reached the below position. Black captured the Bishop with Pawn in this position and had a hard time to win the end game. However, I pointed out that there is a nice small combination here that Black could have played. Do you see it? Today I got my first win in a serious chess tournament against an international master. I defeated International Master Elliott Charles Winslow in a long battle at second round of Tuesday Night Marathon, Winter 2014, Mechanics Chess Institute, San Francisco. I lost to him in the last cycle of Tuesday Night Marathon (Fall 2013) by making an early sacrifice without proper preparation. This time also made a temporary sacrifice to expose his King early in the game. While the material ended up being equal, his one rook stuck in the corner making his position difficult to defend. I see that IM John Donaldson gave 2 diagrams from this game in current issue of Mechanics Chess Newsletter. David Bronstein's book "200 Open Games" (1973 Dover, 0-486-26857-8) is an excellent book on the King's Gambit, detailing at least 24 'gambit games' from his career. The King's Gambit player is described as none other than a "chess d'Artagnan" in his book. "The Mammoth Book of The World's Greatest Chess Games" (ISBN: 978-0-78671-411-7) lists this game as Game #42. This position inspired the scene in the James Bond movie "From Russia With Love" (with 24. Rxf8+ to follow). I just have had a nice spring of tournaments at the end of 2013. First I was joint runner up in Tuesday Night Marathon Fall by defeating the then tournament leader Oleg Shakhnazarov.Then during Christmas break, I played in North American Open, Las Vegas and became sloe runner up in Under 1900 section bagging couple of thousand dollars. As Sadiaa is visiting us from Boston, we made it a vacation plan. We first drive to Los Angeles renting a Chevy Tahoe 25th December. Saiful from San Diego joined us there. We stayed in LAX Marriott and visited Getty Institute next morning. Then we reached Bally's Las Vegas at 26th night where Zeeshan Bhai, Bhabi and their 5 kids joined the party. Ahyan, Zayan and Raisah played in Under 1250 section while I played in Under 1900 (as my rating was 1882). I also met FIDE Master Mehdi Hasan Parag who came from Bangladesh and played in Open section scoring 4 out of 9 games. His current FIDE rating is 2285 and so he was expecting to play in Under 2300 section. However, he found at the very last moment that his USCF rating is 2302 and hence he was the lat seed in the open section. He was accompanied by Rifat Halim bhai who was playing in Under 1500 section coming from Florida. 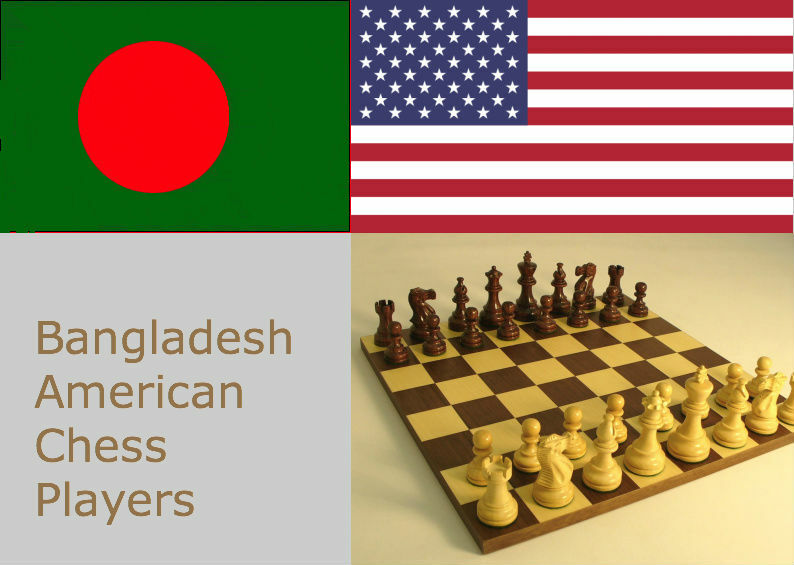 I and Rifat Bhai are trying to see how we can use Parag's chess talent to increase Bangladeshi chess players presence in the top boards of chess tournaments in USA. To my astonishment, I saw the announcement of GM Maurice Ashley's Millionaire Open Chess when I came back to Fremont at 30th December. We came back earlier than New Year's Eve to have 31st night party in Sumit Bhai's house with all our close family friends. I have registered for the Millionaire Chess Tournament already that will be help during October 9th to 13th in Planet Hollywood, Las Vegas (which is adjacent to Bally's where I just played North American Open 2 consecutive years now). I am very hopeful about this tournament and Ahyan will also play in the Under 1000 section. I started a thread in chess.com to promote this event and I am nervous about actually meeting the 1500 registrations by 31st March. GM Ashley has already handled a half million dollar Chess Tournament (HB Golbal in 2005 at Minneapolis) and I trust his calculations and capability in this regard. I wish success to this even whole-heartedly as it will be a great win for the game of Chess in USA. I also played Bay Area International Amateur section (1800-2199 USCF rating group) last weekend scoring an average 4 out of 6. My immediate next targets are Golden State Open tournament that will be held in Concord, California (BART accessible from my home) in Under 2200 section and Foxwoods Open in Connecticut at 24th to 26th January in Under 2000 section. I will meeting Parag and Rifat Bhai there in Foxwoods who will also be playing that tournament.